Your customer conversations are mission critical, so your headset choice is just as vital. 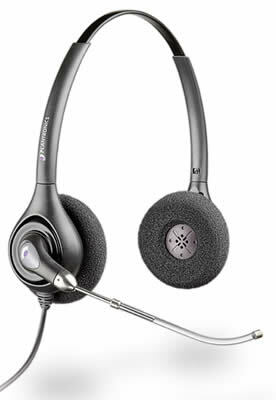 With the Plantronics SupraPlus Wideband HW261 phone headset you get premium audio clarity and all day comfort for office and contact center professionals in a dual-ear, over-the-head design. The SupraPlus HW261 features dual earpieces with foam ear cushions to block out background noise and the Plantronics voice tube. This headset requires an external amplifier or direct connect cable to use it with your phone or computer. Please check our phone headset amplifier options and compatability cables and USB-to-Headset adapters to use your headset with a VoIP system. This model is also available with a noise cancelling microphone.